Biofuel was born out of an increased drive to go green and save energy across the UK. Many boiler manufacturers are choosing to use biofuel as an alternative to fossil fuels. An essential part of this is to install an efficient, high-performance, biofuel-compatible burner within the boiler. EOGB supplies quality burners compatible with with FAME bio blends, as well as conventional kerosene and gas oil. Pressure on fossil fuels and concern over their environmental impact has led to interest in biofuels. These are often made using vegetable oils and other biological waste. European countries have worked together to develop FAME (Fatty Acid Methyl Ester) fuels. These FAME blends use raw materials including waste cooking oils, vegetable oils and animal fats. Biodiesels are available in different strengths, depending on the quantity of biological materials and diesel used. Renewability – Biofuel production consumes waste materials. This means it is not only renewable but also contributes to recycling efforts. Low Emissions – Emits fewer harmful carbon gases than fossil fuels. This lessens environmental impact and lowers air pollution. Security – Eliminates dependence on fuels bought in from other parts of the world. Cost – As worldwide demand for fossil fuel peaks, so too does its price. Europe is establishing more sources of Biofuel, increasing supply and lowering prices. The EU has set regulations for biofuels, ensuring they are more sustainable than fossil fuels. Consideration has also been given to ensure these don’t replace essential crops such as food or contribute to deforestation. EOGB’s XSeries bio burner range is manufactured in the UK. The Burners are compatible with heating systems burning FAME blends up to B10 with our standard Danfoss pump. It is also possible to adapt the burner for use with a B30 blend. 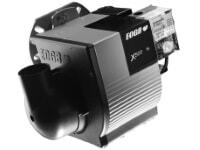 This requires changing the pump to one with the right specifications, which EOGB can supply. There is no need for changes to the other burner components. the criteria for EN267, and have been thoroughly tested to ensure every aspect gives a high standard of performance. XSeries burners are compatible with both biofuels and standard heating oil. If a customer wished to switch their existing burner from one type of fuel to the other, they would be able to do so. To maintain safety and efficiency, a recommission would need to take place. It is also worth noting that if a customer were to switch from biofuel to kerosene, there may be fuel storage issues which they should seek advice about. Because of the properties of biofuels, other products need adaptation to work in a way that is safe and efficient. Rubber parts are particularly susceptible to damage. As well as our eco burner range, EOGB also supplies a number of biofuel-compatible products. These include versatile oil filters which are suitable for use with FAME bio blends up to B50, besides being suitable for standard oils. We also supply KBB fire valves which are compatible with blends up to B50, as well as with ordinary heating oils. These come in both 65 degree and 90 degree ranges, and in a wide range of lengths. Also on the list of bio products we offer are our long-life hoses. These are green in both colour and in environmental terms, since they are compatible with FAME blends up to B100 (100% biofuel). Long-life hoses are also suitable for use with other rapeseed-based fuels alongside standard oils. These hoses are available in all usual sizes with a guarantee of 24 months. EOGB has been working as part of the Biofuel Taskforce, together with OFTEC, to develop a biofuel for the heating oil market. Together with the production of our burner range, this underlines our commitment to helping the environment and making heating technology as eco-friendly as possible.